- 156cm Total maximum hang from ceiling. - Lamp head is 35cm L x 45cm H.
- Takes a regular E27 screw in light bulb. We are instrumental in trading and supplying an extensive range of Industrial Pendant Lamp to our clients. These Pendant Lamp are manufactured keeping in mind the exact application needs of our respected clients. - Widely demanded in farm houses, villas, hotels etc. 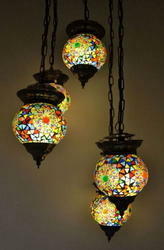 Our company has earned accolades in offering Designer Pendant Light.